Now things are getting interesting. 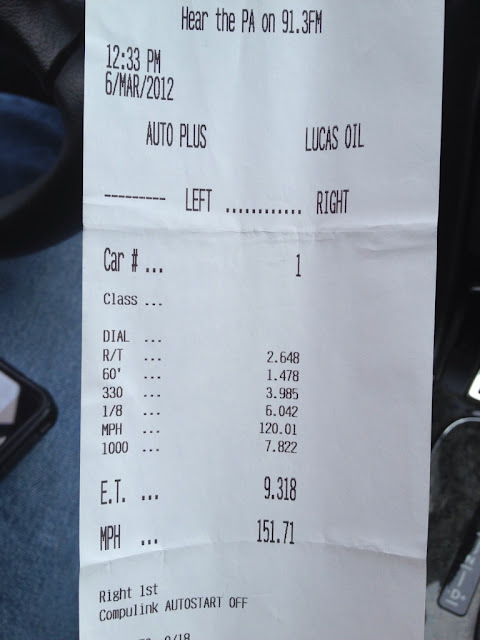 The ShopCT took their Nissan GT-R to the drag strip for some passes, and put some really impressive numbers. With a 6000 rpm launch, yes I wrote 6000 rpm launch, they pushed this AMS built long blocked R35 GT-R to a 9.31@151mph pass. The 6000 rpm launch had a little bit of wheelspin, but it really helped to keep the HKS GT800 turbos lit, for a 1.478 60 foot time. This is one of the few R35 GT-R's ever to break into the 1.4's in the 1/4 mile. The car uses an Ecutek to tune the factory ECU, and control the GR6 transmission and clutches. For tires, the car is running the Nitto NT05R's in the rear, and the Nitto 555R in the front. They say the car isn't set on kill yet, and expect some low 9 second passes at mid 150mph range with it cranked up. Car is running a mild 27psi on e85. 8000RPM launches are where it's at! LOL!! J/K. That is a sweet set up and great that the R35's are trimming down their 60-ft times. They should try Mickey Thompson drag radials. There are a few guys that run Mickey Thompsons. There has been this fine line between boil and bog on the R35. The Cobb 006, and Ecutek are allowing more control over the transmission, so you will see the times drop. I expect mid 8's soon.